Beyond tha,t the same edition of the AFR has an article explaining the conundrum of the Liddell fight, making particular reference to what the advice from AEMO (the Australian Energy Market Operator) actually said. This issue was raised in the comments thread of the post Energy crisis? What energy crisis? AEMO boss Audrey Zibelman took exception to an article Malcolm Turnbull’s bid to flog Liddell to Alinta ill-advised: AEMO. This article in response to Zibelman’s letter – The fight about AGL’s Liddell power station explained – was jointly written by Ben Potter and Angela Macdonald-Smith, both AFR journalists who separately write regularly on energy matters. They’ve made a special effort to get their facts right. Liddell was sold as a package by the NSW government with Bayswater because the pair share coal transport and water infrastructure. Splitting them now would be problematic and basically doesn’t make sense. Liddell was commissioned in 1973 as a 2000MW plant, so will be 50 years old in 2022. Since buying it in 2014 AGL has rated its capacity as 1680MW. However, it is struggling to produce that much. In the December half of 2017 it ran at 40 per cent, down from 52 per cent in 2016-17. AGL has spent $123 million since 2014 keeping Liddell chugging along, and expects to spend a further $150 million by 2022. A Worley Parsons report finds that a further $920 million would be required to keep Liddell open for a further 5 years, to please Malcolm Turnbull and company. Alinta contest that amount. While consultants tend to give their paymasters what pleases them, the fact is that on information before the AGL board power from a revamped Liddell would be priced at $106/MWh compared to $83 for the planned replacement power. It seems that AEMO in its advice about replacing Liddell has rated the clunker at a nominal 1800MW. The base case for AEMO is that AGL will only do what it is already committed to – expand Bayswater by 100MW and complete the Silverton wind farm – and that no-one else will do anything at all to make up the shortfall. The result is that 200,000 homes would lose power for up to five hours once in every three years. That is the least likely outcome, and not a disaster, but would you believe, that is what all the panic is about! AEMO estimates that 850MW of dispatchable supply will be needed by 2026-27 (from me, there is a question as to whether a revamped Liddell would be dispatchable in the context of what the market will require at that time) to reduce the prospect of load shedding once in 10 years. AEMO says that if AGL’s stage 1 is built on time – an additional 570MW of gas, solar and demand response – the risk of outages will be 174,000 homes losing power for 3.6 hours every four years. If, however, AGL delivers stages 2 and 3 – an additional 570MW of gas, 80MW of demand response, 750MW of new solar, wind with a 250MW battery at Liddell – 172,000 homes risk losing power for 2.2 hours once in every 20 years. The 250MW battery would be used to even out frequencies, take the peaks off spot prices, much like the Tesla battery. In this case the problem of site restitution after the Liddell dinosaur is closed is taken care of. The alternative is to spend $920 million to supply essentially unreliable, inflexible power for a further five years, kicking the can down the road on site restitution and what to do to replace lost capacity. It’s a no-brainer. To me it seems that AGL is planning to more than double what they are currently getting out of the limping Liddell. AFR’s letters section today has nothing from AEMO. In the same Thursday 12 edition of the AFR Matthew Warren has an opinion piece Why do politicians think that there are votes in coal? Warren is Matthew Warren is chief executive of the Australian Energy Council, representing, inter alia, Australia’s coal and gas generators. Very simply, he says that renewables are the new normal, and are no longer dependent on Renewable Energy Target incentives. AEMO predicts price reductions from investment in renewables. It takes seven years to plan and build a coal-fired power station producing expensive and inflexible power. The plant would need to last another 50 years to make a proper return on investment. No-one in their right mind is willing to take the risk of producing an expensive stranded asset. Warren sees a wave of 4000MW of renewable energy entering the NEM market over the next two years. Aggregating the suite of recent electricity market modelling, we can get some idea of what is likely to get built through to 2030: around 71 per cent of new investment will be in wind and solar, with the rest made up of firming technologies including gas peakers, pumped hydro (assuming Snowy 2.0 proceeds) and battery storage. That’s $23 billion worth of investment. The last thing we need is politicians getting in the way, or actively interfering, producing confusion and sovereign risk in the market. The question is, does Malcolm Turnbull have a brain, or has he mislaid it or parked it somewhere? New coal power is dead, leaving aside questions of emissions and climate change. On a similar note my mind boggled when I saw Turnbull on the box tonight spruiking this very expensive proposal for making “clean” hydrogen from brown coal. He didn’t mention that all the carbon in the brown coal would end up as CO2 and the renewable hydrogen projects proposed for South Aust would manufacture hydrogen using renewable electricity at much lower cost without the need to produce any CO2. The message seems to be that associating with coal eaters curdles the mind. Liddell was commissioned in 1973 as a 2000MW plant, so will be 50 years old in 2022. Since buying it in 2014 AGL has rated its capacity as 1680MW. However, it is struggling to produce that much. In the December half of 2017 it ran at 40 per cent, down from 52 per cent in 2016-17. Shouldn’t we already be worried/concerned that the AMEO is expecting (accounting for) more from Liddell than it can realistically deliver over the next 4 years of it’s remaining life? Is the estimated shortfall by the AEMO, when Liddell closes in 2022, actually worse? Yallourn W (VIC), Gladstone (QLD), and Vales Point B (NSW) will also be approaching their use-by dates, and likely becoming less reliable, with perhaps more unscheduled drop-outs, or unavailability. The Australian population will likely increase significantly in 4 years time, meaning there will be even more energy demand. So, just replacing Liddell’s capacity won’t be enough. And summers are likely to become hotter for longer due to the consequences of human induced climate change, putting more strain on coal-fired generators, that may need to produce energy at lower outputs. It seems that way: AGL is doing what is perfectly logical and economically viable for AGL. As I have said elsewhere, it’s not that simple just adding up MW capacities; capacity factors for the various technologies also need to be considered. Turnbull is such a dunce on energy matters. He’s tripping over himself to solve other country’s energy problems in a way that leaves all of the waste in Australia to “take out the trash” for Japan. He’s got no idea how wrong keeping huge volumes of CO2 underground can go. And all so his mates can keep cashing in on their cola leases. Meanwhile perma frosts are melting at a huge pace along with Greenland, and now it seems as though the Atlantic Conveyor Current is slowing down leading to the risk of it shutting down altogether putting Europe’s climate at huge risk. Geoff M, you are running off in all directions again. I’m writing a post, not a thesis. It was mostly a precis of the Potter/Macdonald-Smith article, honed up to extract the import. We were discussing capacity factors back at LP about 10 years ago. I would assume the people at AEMO are up to speed with all that, as well as with what is happening elsewhere in the grid. You’d have to look at their document, which I looked for on their site, but couldn’t find. In answer to some of your questions I took it that when AGL were talking about 40 and 52% capacity they were referring to their own standard of 1680MW. Which means that Liddel averaged only 672MW for half a year. 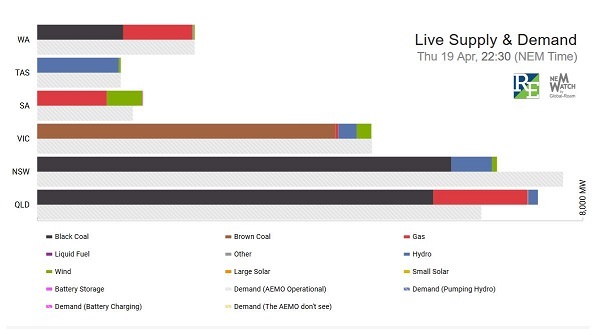 As to why AEMO took 1800MW, I have no clue. It’s my impression that AEMO always use the worst case as their base scenario, so they were assuming the loss from Liddell would be bigger than it really is. I think AGL, to do them justice, are acting a bit beyond what is in the shareholders interests. Vesey does seem to be somewhat on a mission with renewables. Hence his was the smiling face in the background when Jay Weatherill ripped into Frydenberg that time. AGL was involved in a trial of linking up rooftop solar. At the same time he has said that the company’s exposure to coal is higher than it should be purely from a company risk POV. I think their newest coal station reaches 50 in 2048. I think, on the basis of your evidence Brian, Vesey is acting in both his shareholder’s interests and the country’s interests, which means he is acting in his shareholder’s interests doubly,…their financial and long term environmental interests. That has got to make him something of a special CEO. Some Northern Hemispere news has reached Australia. This will cause havoc to the weatherin Europe. Recently my daughter was half way across Germany in a train when the entire German train system ground to a halt due to Cyclone Xavier. This was and extremely unusual event, and now Hurricane Ophelia is affecting Europe. How energy is delivered to Europe from the remnants of the AMOC will change the nature of the storms that form. Apparently there will be a direct effect on Australia but I am unclear as to how that is supposed to work. Regardless our long term failure to act on curbing CO2 emissions is part of the problem that will crunch our economy at an ever increasing rate. At least one Energy CEO is showing some back bone. Geoff M, you are running off in all directions again. I’m asking inconvenient questions that should be dealt with by the AEMO and the NEM. We were discussing capacity factors back at LP about 10 years ago. I would assume the people at AEMO are up to speed with all that, as well as with what is happening elsewhere in the grid. My intent with the questions is not to have a go at you, but to ask what appears to be awkward questions about whether the AEMO and the NEM are really on top of things. I think assuming that “the people at AEMO are up to speed with all that, as well as with what is happening elsewhere in the grid” is not enough – they should be demonstrating that they are on top of things. As she toured the Bank of England’s gold vault, Sujit Kapadia, an economist and one of the Bank’s top financial policy experts, stopped the Queen to say he would like to answer the question she first posed to academics at the London School of Economics at the height of the financial crisis in 2008. “Oh,” she said, slightly taken aback, as Kapadia went on to explain that as the global economy boomed in the pre-crisis years, the City had got “complacent” and many thought regulation wasn’t necessary. Jumpy: Our power system is in a mess because some dingaling who agrees with you privatized most of the system and assumed all would be well because of the magic of the highly inappropriate market systems that were set up. RECOMMENDATION 1: That the NSW Government continue to support the National Electricity Market to operate freely, subject to appropriate regulation. The NSW Government should not seek to invest further in electricity generation. RECOMMENDATION 2: That the NSW Government not consider further implementation of sustainable energy supply schemes that add further costs to consumers. RECOMMENDATION 5: That the NSW Government expedite the sale of remaining electricity generation assets. RECOMMENDATION 10: That the NSW Government not subsidise particular types of generation on a commercial scale. The NSW Government’s response to these recommendations are also found at the same webpage. It seems to me the mess we are now in (at least for NSW, and for the NEM) can be traced back to these documents. It seems to me there are more than a few “dinalings” responsible. That’s a great cartoon, Brian. I love the tie as a head band and the use of Finkle bombs, …and Abbotts shaved chest (always more extreme than any one else). BilB, David Rowe is amazing. He does several cartoons a day. You see them illustrating articles in the AFR as well as on the opinion page. It seems obvious that no-one in the editorial suite is telling him what he can’t draw. Geoff M, it would be more productive if you spent some time trying to find the advice from AEMO to the Commonwealth. Perhaps it is privileged, but Potter and Macdonald-Smith appear to have seen it. Then we would have something to talk about. I’m quite impressed with Audrey Zibelman and would give her the benefit of the doubt unless you have actual evidence of sloppy thinking. It would be quite basic to look at actual capacity delivered and have a view on consumption trends. We do know that there is not a direct relationship between population growth or economic growth and electricity consumption. There is also an expectation that consumers will increasingly generate their own power. The bottom line from the Potter/Macdonald-Smith article was that there is no looming crisis in electricity supply and the scare campaign is one of the silliest they have come up with to date. And they did not say so, but the headline Malcolm Turnbull’s bid to flog Liddell to Alinta ill-advised: AEMO appears to be justified by what AEMO said, but Zibelman is right in saying that AEMO was not formally advising the Commonwealth on Liddell. The idea (and practice) of privatising electricity generation stations did not come out of the blue, in NSW. That State was a laggard. A Vic Labor Govt corporatised the old State Elec Commission, as a clear prelude to selling off the power stations, transmission lines etc. That privatisation was then carried out by our democratically elected Liberal Premier Mr Kennett, he of Beyond Blue. I don’t wish to start one of those tedious Sydney/Melbourne or NSW/Vic disputes, but frankly, in sheer stupidity (if that it was) we down here were miles ahead of youse. Sorry for the delay in responding – I’ve been occupied on other things. The 9-page letter from Audrey Zibelman – AEMO Managing Director and Chief Executive Officer to Josh Frydenberg MP – Minister for the Environment & Energy, dated 16 March 2018, advising the Commonwealth relating to AGL’s proposal to replace Liddell, can be found here. I found it reasonably promptly. This analysis is provided in response to your request for the Australian Energy Market Operator (AEMO) to assess AGL’s plan to replace the energy and capacity currently delivered by the Liddell Power Station (Liddell) following its retirement in 2022. AEMO’s analysis of the Base case demonstrates that, without the entirety of AGL’s plan or comparable investment in resources by others, there remains a high risk of load shedding following the closure of Liddell. Specifically, the analysis shows that once in every three years, approximately 200,000(3) households in NSW may experience power outages lasting five hours. The expected loss of load probability (LOLP) for NSW from 2021-22 onwards is shown in Figure 1 below, and highlights that unless a combination of more generation, demand side participation, storage or transmission capacity is built, there is a significant risk of load shedding over peak periods after Liddell’s retirement. The risk grows every year due to projected increases in NSW electricity demand, driven largely by continued population and economic growth forecasts. The AEMO says that AGL has only committed (as at March 16) to the Bayswater 100 MW upgrade (Base case). AGL has proposed to invest in Stage 1, but the AEMO does not consider this as a “committed resource” (as at March 16). AGL has also advised “they would potentially invest” for Stage 2, but I interpret this to mean Stage 2 is still not a firm commitment. And AGL also “identified a willingness to consider investment” in Stage 3 “if the market had not already invested to cover it” – again, this appears so far to be not a firm commitment. The 850 MW reliability gap in resources available to serve NSW reflects the risk of non-performance of generators under high demand conditions (based on recent observed performance constraints), updated consumption forecasts, the lack of predictability around the contribution of renewable generation at times of peak demand, and limitations on interconnector support. Specifically, temperatures of 40 degrees or more in Sydney could be the catalyst for extreme 1-in-10 year electricity demand conditions, particularly when these temperatures are experienced towards the end of the day when business demand is still relatively high, residential demand is increasing and rooftop solar generation is declining. In short, under the Base Case scenario, when Liddell retires there is a significant potential for involuntary load shedding during these hot summer days, without additional investment in dispatchable resources. New wind and solar-PV are not “dispatchable resources”, without adequate energy storage capacity (i.e. MW and MWh). I’m quite impressed with Audrey Zibelman and would give her the benefit of the doubt unless you have actual evidence of sloppy thinking. On reading her advice letter, I’m impressed also. It appears to me (as far as I can tell) that the AEMO has a handle on the situation concerning the consequences of the retirement of Liddell, covering the issues I referred to in my comment (at APRIL 13, 2018 AT 5:44 PM) and more. It appears this is your interpretation of the Potter/Macdonald-Smith article. Unfortunately, the AFR article by P/M-S picked out only some parts of the AEMO letter and didn’t cover some of the key issues. I interpret the circumstances described in the AEMO letter differently – I think there are sound reasons to be presently concerned about Australia’s electricity supply reliability and affordability when Liddell closes in 2022. The real worry is whether the Turnbull government will continue to hinder what needs to be done to improve Australia’s energy security, energy affordability, and substantially reduce our carbon emissions into the 2020s and beyond. Geoff M, thankyou for finding the AEMO letter. From the url it seems the link was on the page I looked at but I missed it. I think you’ll have to agree that it was thorough and took into account all the factors you feared it didn’t. to assess AGL’s plan to replace the energy and capacity currently delivered by the Liddell Power Station (Liddell) following its retirement in 2022. The short answer is that if AGL goes ahead with the full plan there should be no problem in terms of energy security. Please note, AEMO was not asked whether there would be a problem if the old clunker was revamped and what the risk would be if it had to perform to capacity in 40 degree plus heat. It sees a risk in other plants failing under a 1 in 10 years heatwave, but not a retained Liddell, which was outside its terms of reference. AGL cannot be blamed for not formally committing to all stages at the outset. That’s why there are stages – so that the board can responsibly assess at each stage whether it is still prudent to go ahead or whether circumstances have changed to make the later investments unnecessary for the market and unprofitable for the company. If others move in and supply the market, there is no point in AGL investing in superfluous supply. Specifically, the analysis shows that once in every three years, approximately 200,000(3) households in NSW may experience power outages lasting five hours. I attempted to do some maths. NSW has about 3.4 million small customers. So 200,000 is about 5.8% of the whole. Five hours in365 x 24 is 0.057% of the time. So the outage contmplated is if my maths serve about 0.0033% of the entire market. I checked the reliability standards and the AEMC Reliability Planning group has recommended sticking with 0.002%. However, that is for a financial year, not three years. So I’m saying that there is not a problem, even at the lowest level of replacement. In commonsense terms, 200,000 out for five hours is one decent summer storm in SEQ. So no, I don’t think the AFR article was unfair. 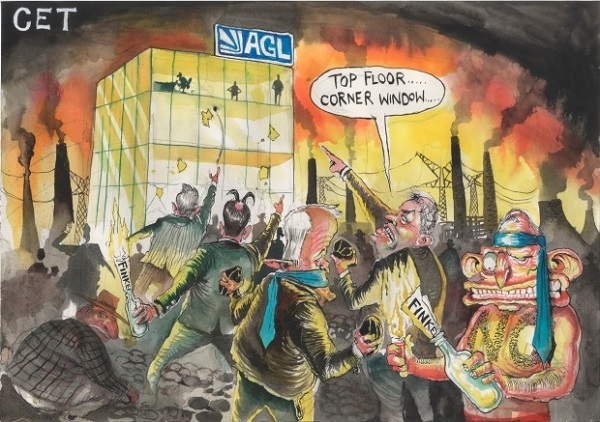 Can I ask you, do you think AGL should sell Liddell to Alinta? Or do you think AGL should be allowed to prudently pursue their plans to replace Liddell by creating, in stages, a renewable energy hub? That’s the question, it seems to me. There is a further question as to whether the Commonwealth, with no responsibility in electricity generation, but a responsibility to reduce emissions by virtue of its foreign affairs powers and the Paris agreement, should be bullying and hassling individual companies working in the electricity market. Can I ask you, do you think AGL should sell Liddell to Alinta? I don’t think Liddell is worth anything to Alinta. It seems to me it’s just an idea (thought bubble?) that Turnbull put to Alinta – Alinta has not done due diligence yet. I think it’s worth more for AGL to keep, unless AGL is made a ludicrous offer for Liddell, but I doubt that will happen – we’ll see. AGL has already spent about $150 million trying to ensure Liddell runs as reliably and efficiently as an ageing plant can since buying it from the NSW government several years ago. But Liddell has still suffered frequent outages – including a critical one during the heatwave in February last year when NSW ran short of power and AGL had to switch off Tomago Aluminium’s potlines at great risk to the operation. And the boilers, and the pipes running from the boilers to the turbines, are still said to be the original ones, with all the wear, tear and fatigue of 46 years of faithful service. Internationally, only 1% of power stations in operation are older than 50 years. I think the economic arguments (for AGL, or Alinta, or any other prospective buyer) to extend Liddell’s life beyond 2022 aren’t there. The short answer is that if AGL goes ahead with the full plan there should be no problem in terms of energy security. Big if! Liddell is likely to be closed at the end of March 2022 – that’s less than 4 years time remaining. 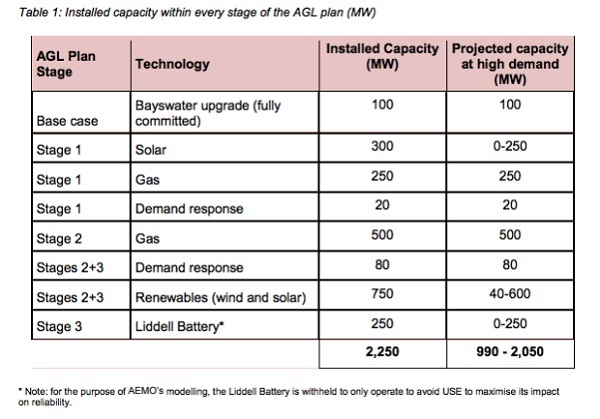 And AGL has only committed so far to the base case scenario. As time passes there are less and less options available, until there are none remaining. AGL needs to commit now, and any shortfall remaining needs adequate time to be acted upon by other potential players. Please note, AEMO was not asked whether there would be a problem if the old clunker was revamped and what the risk would be if it had to perform to capacity in 40 degree plus heat. It sees a risk in other plants failing under a 1 in 10 years heatwave, but not a retained Liddell, which was outside its terms of reference. If he’s right, then more high temperature records will likely be broken, putting even more strain on not only “clunker” Liddell, but other “clunkers” like Yallourn W, Gladstone, and Vales Point B, and all other coal- and gas-fired electricity generators that may be affected by extreme conditions. So the “1-in-10” heatwaves will likely become the new normal, resulting in “a significant potential for involuntary load shedding during these hot summer days“, wouldn’t you think? And Australia’s population continues to grow, increasing demand for more electricity. So, it’s not just replacing Liddell’s capacity, but also adding more capacity to keep pace with growing demand. But wind and solar-PV are not ‘dispatchable’ without adequate storage. So, I think the risk of blackouts are real and substantial into the 2020s, and so far there is inadequate commitment to date to minimise this risk. Geoff M in response to your comment of 2.16 pm. I’m not so pessimistic about sufficient capacity coming on board to keep the lights on if we don’t start closing coal and gas power stations before maturity, which of course we need to do for reasons that David Spratt enunciates and I’ve been blogging about for at least 10 years. I do agree, but I’m not sure when. My guess would be some time after 2030, although earlier would not surprise. I’ve noticed that there have not been any stories of coal or gas stations melting in the heat this summer. In early 2017 they certainly did. I know that in Qld a special effort was made to clean up the govt-owned stations in preparation for the summer. You could be right, you could be wrong. I think it’s an opinion based on supposition. Geoff M, in response to yours of 1.34 pm. Geoff, I’ve already posted that link about old coal stations killing people, can’t remember when and where, but it doesn’t hurt to remind people. I don’t think Liddell is worth anything to Alinta. It seems to me it’s just an idea (thought bubble?) that Turnbull put to Alinta – Alinta has not done due diligence yet. Alinta is, I understand, Chinese owned and are likely to have deep pockets. I suspect their interest is in extending market share. In other words it’s the million customers that lights their fire. I’d worry about their commitment to site restitution, which the AGL plan takes care of. As to due diligence, they are making strong statements about AGL’s claim that it will take $920 to fix the plant to serve beyond 2022. I wonder what such claims are based on. Lily D’Ambrosio told Fran Kelly on RN that Victoria is not ready to sign off on the NEG tomorrow. I think Qld and the ACT also have problems. I’ll try to do a post tonight, but the bottom line is Frydenberg needs consensus on this, not a majority vote. Then he has promised to clear whatever the states agree on with the party room. It looks like mission impossible. Some people care about the environment and some people care about coal. Big Australia: Are we ready? Clearly, coal fired power plants are struggling to supply during peak hours in hot summers. So what does the NSW government do? Apart from pulling out from Snowy’s hydro power it adds more peaky demand by promoting and approving entire new skyscraper cities like the Parramatta CBD. The energy illiteracy and contradictions in planning are only too obvious. The NSW government is doing exactly the opposite of what it should do, namely to invest in renewable energy and to curb current power demand. It should also ask the Federal government to reduce immigration because a growing population is on a collision course with limited energy supplies including, of course, oil and liquid fuels. Summers only need to get a little hotter in future to overload the system, or one or more power stations fail, or an inter-connector fails at the wrong time, and “involuntary load-shedding” will happen. Beyond the 10 year timeframe existing plant will begin to reach the end of its economic life at 50 years of service. Figure 9 highlights the magnitude of this reduction over the 10-15 years from 2021 assuming no early retirements due to asset impairment. The power stations are stacked in order of retirement with Liddell the first to reach 50 years of service in 2021/22, followed by Wallerawang in 2027/28, Vales Point in 2029, Eraring in 2033/34, Bayswater in 2036/37 and finally Mt Piper in 2042/43. This roll-off of capacity and energy production will require significant investment in new base-load plant. Figure 9 shows the roll-off of NSW base load capacity after 2021. This Figure 9 was included (as Figure 20) in the inquiry’s Final Report to the NSW Government. Since the Delta Submission was presented, Wallerawang has been ‘mothballed’ in 2014, then retired in 2015, and is currently being dismantled. Liddell’s generating capacity and reliability is diminishing. So, it’s not as if the NSW Government was not aware of the situation. I think the NSW Government has abrogated it’s responsibility to ensure the state has adequate electricity energy security by selling off the generator facilities and expecting the market to fill the supply gap. Governments have failed to plan for a secure energy future. If you fail to plan, then you plan to fail. Until Alinta, or any other prospective buyer(s) have done due diligence, any statements about buying Liddell should be taken with a grain of salt. AGL have done their scenario planning and worked out the best path for AGL to take re Liddell. But so far AGL has only committed to the Base case plan. Why the delay (per AEMO letter as at March 16) with committing to Stages 1, 2 and 3? Thanks Geoff M for providing some detail. I’d missed the coal-fired failures in early March. Also I’m simply not able follow what happens in NSW in detail. Queensland’s population at 4.984 million is about 63% of NSW’s at 7.895 m. Since Hazelwood closed I’ve noticed that Qld often generates more power than NSW. Late last year Hugh Grant who used to work for Powerlink in Qld, the high voltage transmission outfit, and follows power issues as his day job, told local radio here that there is plenty of power in Qld, so no need for a new coal-fired plant in the north. Certainly there is also plenty in the development pipeline. So the prime need may be for an enhanced interconnector. And the NSW government may be asleep at the wheel. Incidentally, the above also shows the current reliance on coal and gas when the sun doesn’t shine and the wind doesn’t blow very much. Any way I can see now why you are concerned about whether NSW is keeping up with the game. Nevertheless, if we are relying on markets, an intervention by the Commonwealth would be a huge mistake, adding to Snowy 2.0, I think on balance a mistake. Other than that I have no idea why AGL doesn’t start with stages 2 and 3. I can only guess that they have planned it that way and stages 2 and 3 will not be far away. Could it be, that when Liddell is running, its output is quite profitable still, though higher and higher maintenance and repair costs are likely and looming? Ambi, I’m sure that Liddell is still profitable. I believe AGL has said so. They are not a charity. I’ve done a new post on the National Energy Guarantee (NEG) being considered today. I haven’t had time to do a comprehensive post, so have ignored issues relating to retail, price and energy security, concentrating mainly on emissions. I don’t doubt the stats. I note that Queensland’s Gladstone 1680 MW nameplate capacity power station will be 50 years old in 7 years time. Queensland needs to plan for replacing this capacity. There’s a bit more time for Queensland, but it can soon disappear, and replacement capacity options begin to dissipate. Before the SA state-wide “black event” I suspect the NSW government was “asleep at the wheel“. I think that was a big wake-up call for all governments. I’m puzzled that all the public commentary to keep Liddell running seems to be coming from the Feds – there seems to be little, if any public discussion coming from the NSW State Government that I’ve seen – yet approving new generators would be in the NSW Government’s remit. I note that Queensland’s Gladstone 1680 MW nameplate capacity power station will be 50 years old in 7 years time. I note that Queensland’s Gladstone 1680 MW nameplate capacity power station will be 50 years old in 8 years time. Victoria’s Yallourn W power station will be 50 years old in 7 years time. Any way I can see now why you are concerned about whether NSW is keeping up with the game. NSW has raised either $22 billion or $38 billion on the sale of its electricity assets, depending on how you calculate it, but it has not reinvested a cent. The table headlined NSW needs 20 GW power by 2035 is worth seeing. I think it backs up my concerns. Geoff M, yes that recent article from David Leitch does put the situation with NSW very clearly. We’ve been told that Snowy 2.0 will lose 30% of it’s energy, so you only get 70% of the input. I’d expect that is before transmission losses. Another way of putting it is to calculate 30 as a percentage of 70. It is accurate to say that for every unit of power delivered by Snowy 2.0 another 43% will have to be used in generating that power. A new transmission line was being developed to link some of the major projects. The best kept secret: ALP electricity policy for Queensland posted a month later has a map with projects all over the polpulated parts with 10,750MW in the pipeline. It also links to an AEMO site, where we learn that Qld has a net 12,859 MW existing (includes announced withdrawals), 1,955 committed, and 12,650 MW proposed, including 1000 MW OCGT gas. There are some plans for batteries and pumped hydro to ‘firm’ new renewables, but Qld could use existing plants to firm renewables. For example, the government-owned CS Energy has a contract to buy the energy produced by the Kennedy Energy Park for 10 years. The latest for NSW shows a figure of 14,319MW existing, including a 2000MW withdrawal. Almost certainly that is Liddell. NSW has 972 MW committed and 14,057 MW proposed. I think it would be helpful if someone like David Leitch took this information as his starting points and then explored the detaiul, including when projects are likely to come on stream and how much power will be delivered as against the nameplate capacity. Queensland came from a standing start in February 2015, when the Newman LNP fossils were given their marching orders. Round trip efficiency at 2000 MW is 67%. 1000 MW output from Snowy 2.0 then 1316 MW input will be needed. Primary energy is required to make Snowy 2.0 function. At 1000 MW power output from Snowy 2.0, for every 1000 MWh energy produced requires 1316 MWh energy inputted from primary energy sources. The big advantage of snowy 2.0 is that it is a large expensive project that provides a good photo op for a desperate politician. Problem is that it is not in the right place and involves long tunnels and long power lines from the source of power and customers. Small scale pumped hydro in better locations makes more sense. While i haven’t got costs I suspect that it may make sense to build solar thermal with molten salt heat storage to provide baseload to the extent that it really is required. I get no sense that any serious cost and operating comparisons were made before announcing Snowy 2.0. Funny thing, I doubt that I am the only one who doesn’t want the man who so thoroughly stuffed up the NBN making technical decisions. Previous discussion here highlighted difficult (near impossible?) tunnelling due to the local geology. Also, a completed survey of many hundreds of suitable sites around the country, excluding the Snowy dams, some of which must surely be closer to generation and electricity consumption areas. Has there been an engineering and financial analysis? I hear that thought bubbles are inexpensive, although the associated photography, helicopter flights and Hi-Vis vests can be pricey. Seems it makes no sense at all unless we lift renewable energy targets beyond 50%. Then it takes so long to build, batteries and solar may well be cheaper by the time we get there. Where we are at is that on the basis of a $29 million feasibility study the Commonwealth has stumped up $6.2221 to buy out Victoria and NSW, and NSW has put the project on ‘fast track’ so that you don’t need to look too hard at environmental issues and such, like what to do with the tunnelled rock. Malcolm T has succeeded in confusing everyone. Now there is a proper feasibility study to be done, because guess what, the first did not make the business case. John D on p60 of the Marsden Jacob report there is comparative costs of pumped storage. Probably already cheaper then batteries, but a wide variation and one complete outlier on the upside. The big advantage of snowy 2.0 is that it is a large expensive project that provides a good photo op for a desperate politician. I suspect you are being mischievous, John? “Snowy 2.0” is 2000 MW of pump-hydro (not primary energy generation) that won’t be operational until 2024 (6 years’ time) at the earliest, and possibly blow out to 2025 (7 years’ time). Liddell’s nominal 2000 MW nameplate capacity will be withdrawn probably in March 2022. So, there’s at least a 2-3-year supply deficiency. And in 2025, Yallourn W with 1480 MW nameplate capacity will be 50 years old (which may perhaps be extended to operate out to 2026 when the operating license for the supplying coal mine expires). In 2026, Gladstone with 1680 MW nameplate capacity will be 50 years old. My point is that 2000 MW of non-primary energy is being added at about roughly the same time that 5160 MW (>2.5 times) of ‘firm’ primary energy nameplate capacity is likely to be withdrawn. And Turnbull is facing an election in less than a year’s time, so it’s becoming less likely he will be PM when Snowy 2.0 becomes operational – and I suspect if the Coalition loose government Turnbull is likely to resign from politics – so, methinks no photo op likely for him. Someone else will likely get the kudos – we’ll see in time. Whether pumped-hydro is small-scale or large-scale, adequate primary energy is required to make pumped-hydro function. More importantly, the primary energy being used to pump the water up to the top reservoirs in the pumped-hydro systems is excess, cheap energy that is not needed by consumers at the time it is being generated. There won’t be excess, cheap energy if there is inadequate primary energy generator capacity. Australia needs to build more renewable primary energy generators with the appropriate mix of technologies, while appropriately phasing out fossil fuelled generators. It’s reported that project Aurora is $650 million for a single 150 MW capacity, 8-hour storage solar thermal “power tower” generator – $4.34 million per MW. A one-off is usually the more expensive way to do things. The unit cost for several (or more) “power tower” generators with larger capacity (e.g. 200-220 MW) and greater energy storage capacity (e.g. 17 hours) may be similar, or perhaps even cheaper. •	The first 1,000 MW is priced at similar price to SolarReserve’s existing Crescent Dunes Tonopah project — $AU10.5 million per MW. •	The next 1,600 MW is priced slightly cheaper at $AU9.0 million per MW. •	The next 2,400 MW is priced at Sargent & Lundy’ conservative mid-term estimate for the Solar 100 module which is $AU6.5 million per MW. It seems to me the BZE Stationary Energy Plan costings are already outdated and excessively high when compared with the more recent quoted Aurora project costs. I agree; Australia needs to build many solar thermal with adequate energy storage generators. We need to get cracking! The energy company has announced it will build the 252-megawatt gas-fired plant near its Newcastle Gas Storage Facility, completing construction at the end of 2022. The new plant will consist of fourteen 18-megawatt gas engines. It appears this is only committing to part of Stage 1. There’s no mention of the Stage 1 solar (i.e. 300 MW installed capacity, 0-250 MW projected capacity) & demand response (i.e. 20 MW projected capacity) components. A quick search suggests these still haven’t been committed to by AGL, but please correct me if I’m wrong. The other key fact reported is: “completing construction at the end of 2022“, which begs the question: When exactly will Liddell close? If we look at Hazelwood, it closed at the end of March 2017, after the summer peak. Will AGL extend the life of Liddell out to the end of 2022, until this new gas power plant is commissioned? Can Liddell be sufficiently reliable for that long? Speaking at an event following its commitment to build a new 252-megawatt gas-fired power station in Newcastle, NSW, AGL chief executive Andy Vesey said the energy company could commit to phase two of its three-stage Liddell power plant generation replacement plan by the end of the year. AGL’s Stage 1 plan includes the 252 MW gas-fired power station, that AGL committed to build on Thursday (April 26) for operation by the end of 2022. AGL’s Stage 2 plan includes a 500 MW gas-fired power station. There is no doubt that the U.S. can produce substantial amounts of shale gas and tight oil over the short- and medium-term. Unrealistic long-term forecasts, however, are a disservice to planning a viable long-term energy strategy. The very high to extremely optimistic EIA AEO2017 projections impart an unjustified level of comfort for long-term energy sustainability. As sweet spots are exhausted, the reality is likely to be much higher costs and higher drilling rates to maintain production and/or stem declines. The “shale revolution” has provided a reprieve from what just 13 years ago was thought to be a terminal decline in oil and gas production in the U.S. It has sparked calls for “American energy dominance”(2)—despite the fact that the U.S. is projected to be a net oil importer through 2050, even given EIA forecasts. This reprieve is temporary, and the U.S. would be well advised to plan for much-reduced shale oil and gas production in the long term based on this analysis of play fundamentals. This suggests the US cannot sustain at or near current (i.e. 2016) rate of gas production for much longer. When US gas production begins an inevitable sustained decline, it is unlikely other major global gas producers (e.g. Russian Federation, Iran, Qatar, etc.) can replace all the production shortfall. A global gas supply-demand gap is likely to then ensue, which will likely raise world gas prices. Australia’s gas prices are linked to the global gas markets. •	Historically, gas exploration has a sustained record of finding reserves. Thus, there is a strong likelihood of finding more conventional gas resources. However, the rate of reserve additions has recently slowed and additions have been exceeded by production (figure 4.2). Further opportunities for large discoveries remain with the development of new technologies and play concepts, and the advance of exploration into frontier areas (e.g. Bight Basin). •	Australia also has significant unconventional gas resources–CSG, tight gas and shale gas. Coal seam gas EDR have doubled in the past three years to an estimated 35 905 (32.6 tcf). This is equivalent to about a quarter of the recoverable reserves from Australia’s conventional gas fields. Total identified resources of CSG are estimated to be around 223 454 PJ (203 tcf), including SDR estimated at 65 529 PJ (60 tcf) and inferred resources of 122 020 PJ (111 tcf). Despite the seemingly rosy outlook in the AERA-2nd Edition, projected Australian gas production increasing significantly more than present rate will deplete its proved reserves much sooner. This may mean Australia’s proved gas reserves could be depleted within a few decades – possibly within 2 decades. Without an adequate and affordable gas supply, then existing and new gas-fired generators will become non-viable and noncompetitive. Humanity must leave oil, gas and coal, before 2050, to mitigate dangerous climate change. Based on the evidence I see, I think the AGL plan (and any other companies’ plans) to build more (or continue to sustain existing) gas-fired electricity generation simply don’t make good business sense in the medium to long-term. The interesting question is: Why doesn’t AGL (and other companies requiring gas) come to the same conclusion? Why is AGL intending to build new gas-fired electricity generators? I think these will become “stranded assets” in the 2020s. I agree, but very simply, we need to stop making emissions as a byproduct of generating electricity or heat ASAP. Brian: Gas fired could easily become stranded because of rises in gas prices, dropping cost of renewables and storage and a growing sense of urgency re emissions. It could also get stranded because of increasing use of demand management and businesses like aluminium being charged power at peak costs during peak demand.